I can’t stop thinking about the Cold Play song The Hardest Part, so I had to Google the lyrics. The second, in the shower. I have never been a singer or crier in the shower, but it has slowly become my favorite hiding place. In there I feel like no one can hear my sobs over the rushing water. I know that’s not particularly true, but just the idea that no one can hear gives me comfort. Number three happened this morning in my room at the hospital, waiting for the bell to ring and the strangest start. This was by far the worst one of all. Once they hooked me up to the drip and catheter, reality suddenly burst in and punched me squared in the face. It felt as if I was dying. The room started closing in on me and I completely freaked out. Johan held me as tight as he could while I shook and sobbed uncontrollably. All I could think of was to pull everything out and run home. And, I thought about dying. I was so afraid something might go wrong and I would die today. Horrible, horrible thoughts ran through my head. I honestly did not know if I could make it through the day. Thankfully, the nurses came in not too long after and wheeled me to theater. As we rolled down the hall with Johan holding my hand, I felt like I was in a movie, a horror movie. Today has been the hardest day of my life. I have no regrets, as we didn’t have another option. Yet, it makes it no less painful. They have put me in the maternity ward, as the doctor says the nurses here know how to better care for a patient with a c-section. Hearing the cries from the babies down the hall should be considered torture for someone in my condition. I chose not to see our baby, however, Johan did. He said he was beautiful, but that one could see right away that there was something terribly wrong. Knowing that one of us saw him is enough for me, as my biggest fear in all of this is that we didn’t honor our son enough. Today felt like the hardest part, but the song is right, the procedure is behind us and all we need to do is let go of the pain and start recovering, just letting go, that’s the hardest part. 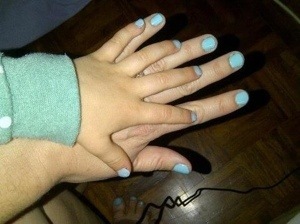 Last Wednesday, I decided I would paint my nails blue in remembrance of our boy. My mom did too, then Tria and Keira, Amanda and her girls, plus her sister in law and her daughter. Then Tria’s sister in law in Namibia, and my best friends, their daughters and their sisters. My older sister Natalie and her daughter Bailey. Other sister in law Lee. And the list goes on and on. 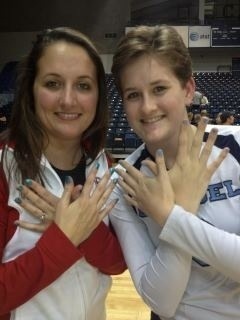 Friends from all around the world have painted their nails blue in support of our family. 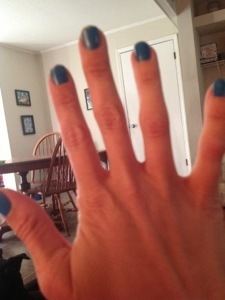 I am so surprised every time someone tags me on Facebook with their blue nails. It means so much to me and reminds me that we are truly blessed with amazing friends and family. A huge thank you goes out to you all for the kind emails and messages. To the other women who have shared their stories with me, thank you. You give me hope for our future. I love you & your family. GOD WILL OPEN ANOTHER DOOR. I hope to see you soon. Thank you, Aunt Sybil. We will see you soon. I love you more Bailey! Blair, my heart breaks for you. I cannot begin to imagine the pain you are going through. You are so very brave to share your story with the world. I am thinking of you and your beautiful family. Hugs from NC my dear. Oh Blair – I can’t wait to see you and give you a big hug. You have been in my thoughts every minute of every day and my brother has been keeping me posted. Hang in there. I know it is a terrible terrible time but you will heal and you will be blessed in time to come. Blair. I’m just catching up and I’m so incredibly rocked for you. I’m just so sorry. 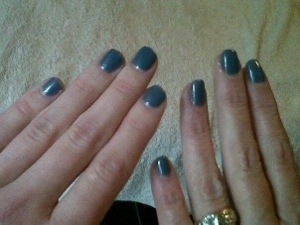 My nails will be blue asap and my heart will be pouring out prayers for you and Johan. I’m so sorry, friend.